The oceans of the world are obviously large and contain massive amounts of energy in them. Just think about how much energy is involved in moving the vast amounts of water around our planet. While it is clear that the potential of using the oceans as an alternative source of energy is an attractive idea, the question is how do we harness the ocean energy and convert it into a renewable energy resource. 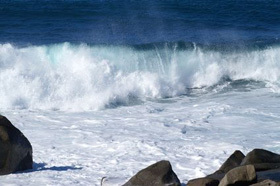 Ocean wave energy or wave power energy is the process of harnessing the ocean waves. Waves, as powerful as they are, are caused by the wind blowing over the surface of the ocean. As the wind passes over the surface of the oceans, a portion of the winds kinetic energy is transferred to the water below, generating waves. These waves might look like they move or propagate in one single movement and direction, but instead the water stays stationary passing its energy along, much like the “Mexican Wave” at football games. Then “ocean wave energy” uses the vertical movement of the surface water that produce tidal waves. Ocean wave energy is one of the cleanest renewable sources of energy to use, but unlike tidal energy which uses the natural ebb and flow of the ocean to get energy, wave energy technology uses the vertical movement of the surface water which produces the tidal waves. Wave energy converts the periodic up-and-down movement of the oceans waves into electricity by placing equipment on the surface of the oceans that captures the energy produced by the wave movement and converts this mechanical energy into electrical power. Harnessing the energy of the ocean waves is done by using ocean wave energy devices and there are a dazzling variety of designs such as: bobbing objects called “ducks”, buoys which float on the surface, articulated rafts which undulate with the flow, overspills were the waves break over the device, and many others. All these different types of devices have the same thing in common, they all convert the wave energy into mechanical and then electrical energy. Most of us know that the strongest types of waves come not near to the shoreline, but a lot further out, so some of these ocean wave energy devices can be located far offshore. Then most wave energy devices are in places where there are lesser sands, sandbars and other obstacle to block the waves energy, and that is in the deeper waters. Generally waves need momentum to grow bigger and by not having any obstacles in their paths, it will be easy to gain momentum in the deep waters. With recent breakthroughs and advances in technology, wave energy is now being considered as a fully green and renewable energy. In most developed countries more than 75% of the population lives within 50 miles of the ocean or sea. That means ocean wave power is a brilliant form of energy, and it is right where it needs to be. There are many wave energy advantages but there are also several disadvantages when you use wave energy. Wave energy is an abundant and renewable resource produced by the wind as the Sun heats our atmosphere. No harmful gases or emissions produced during its operation. Small wave energy devices are capable of producing a great deal of energy. Although construction and positioning of wave energy devices can be high, the “fuel” is free. The effect on the environment is deemed to be minimal. Wave energy is more effective near coastal areas, of which there is a finite supply. Energy generated from the waves is unpredictable as waves sometimes vary in their intensity. This variation in intensity means that harnessing wave energy can’t be done with few wave generators. Wave energy devices that are fixed to the sea floor could cause disturbances to the natural flow of the marine ecosystem. Accidents and storms may cause damage to the energy generators and environmental concerns. There is no disputing that ocean wave energy and its generating devices are in their infancy. With so much energy floating about in our oceans it only takes one successful strategy to make a big difference. Most people agree that ocean energy generation is one of the major renewable energy forms of the future. The possibility of harnessing renewable energy is endless and limitless. The only thing that can hold us back is our imagination and physical capabilities and hopefully soon our technologies will be able to make these feasible. To learn more about “Ocean Wave Energy” and how to generate your own electricity using the power of the sea, or obtain more tidal energy information about the various tidal energy systems available, or to explore the advantages and disadvantages of wave power, then Click Here to order your copy from Amazon today about ocean, tidal and wave energy, the energy revolution from the sea. When the wobbling movement of a floating body is connected to a rack of gears, this rack of gears will move up and down. Resulting reciprocal movement could be taken up by a pinion to generate oscillatory movement on a shaft. Such oscillatory movement is turned to unidirectional motion using this new device.